There are many people who find rigorous arguments more convincing. If you learn to construct rigorous-looking arguments you will be able to more effectively convince such people. Groups of people who share conventions of rigor have more effective ways of disagreeing and arriving at truth through discussion. international capital mobility over the past two decades (a) has expanded much more rapidly than almost anybody had predicted, but (b) has expanded in the wrong direction—the poor have not been borrowing from the rich to finance their investment and industrialization, instead the rich have on net been borrowing from the poor to finance their own consumption. The attraction is that the core—especially the United States—offers a form of protection for capital against unanticipated political disturbances. Since 1990 global investors have valued the American provided political risk insurance that they can obtain by placing their money in the United States more than U.S.-based companies have liked the idea of producing abroad in places where the wages of labor are lower. I first saw this in Greenspan’s book. He mentioned that poor countries tend to have higher savings rates, but did not pose political instability as a cause. If you are Tanzania or Mali or even Bangladesh, it takes 4 percent of GDP devoted to national savings and domestic prices to produce a 1 percent real investment share of GDP when real investment is measured at standard international prices. This implies an extraordinarily tilting of relative price structures against the poor countries of this world: it requires enormous domestic savings efforts to get even tolerable amounts of real capital to use for development. It also points out a defect in the thesis that one reason that poor countries are poor is that their citizens or their leaders or their governments have by and large chosen to consume rather than to save. That is simply not the case: savings rates on a national level have little or no partial correlation with prosperity. It is relative price structures, and thus real investment shares of GDP as measured in international dollars, that have this high correlation. This I don’t really understand. Do they mean that savings in developing countries have the effect of depressing the exchange rate, leading to a slower increase in real terms? DeLong and Summers (1991) found that the post-World War II crosscountry dataset contained an extraordinarily strong correlation between growth and private investment in machinery and equipment. Public investment by state-owned monopolies did not do it. Investment in structures did not do it. The correlation was very strong in OECD-class and middle income economies. Saw this cute fixture in a restaurant in NYC. 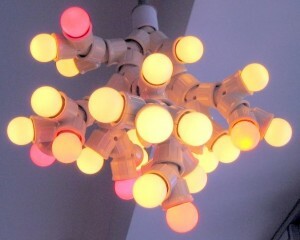 Reminded me of a genre of hedge fund interview question – what is the relationship between the number of Y-connectors and light bulbs? Note that how the Y-connectors are attached to each other does not matter. What I don’t understand is how following economic incentives can make a nation’s economy weaker. Are the economic signals wrong, or are the investors (the students) ignorant? Absent evidence so, the flight from science and engineering could be an efficient reallocation. Heck, I’m one of those who are leaving. The only other possibility that comes to mind is that benefits from science education are a public good – benefits from having such an education exist, but are enjoyed by society overall and cannot be efficiently captured by the individual. If you want to know where innovation comes from, you have to understand cognitive diversity – cognitive diversity is critical for innovation. And an easy route to cognitive diversity is through demographic diversity – diversity in ethnicity, nationality, place of birth, gender, sexual orientation, age groups. Benefits from such result in the clustering force. Most of the people I know who criticize the paternalistic policies of modern Asian nations are bent on replacing that paternalism with another paternalism of their own design. Pluralism requires a bigger cognitive jump, I think. At 53:30, Florida explicitly mentions the missing element in trying to create Silicon Valleys by combining universities and venture capital – you are still missing the tolerance for diversity, which is left out because of its subversive potential. Diversity is not all good, however – according to Robert Putnam (KSG), there is evidence that diverse neighborhoods exhibit more social isolation. That study is consistent with “Who’s Your City” in determining a positive correlation between diversity and creativity/economics, but finds that social trust is lowered by diversity. Went to Ikea today. Ikea really supplies from many countries – the labels I read had China, USA, Israel, Indonesia, Bangladesh, Thailand, Portugal, Spain, Italy… and probably more that I have forgotten. I had a fun time running around and guessing before looking. Rent seeking is the expenditure of scarce resources to capture an artificially created transfer. Basically, it is harmful to give things away for free. This is because people will compete to influence your choice (of who to give to), but since you refuse to accept money, they will spend on things which do not increase your ability to conjure up more of the supplied good, e.g. a more convincing proposal or a more extravagant charity event. The surplus from the exchange is thus partly dissipated away. This type of behavior is known as rent seeking.